The Fireplace Warehouse offers excellent fireplace and stove accessories and spare components. Consider selecting this well-manufactured 125mm solid fuel rain cap to help prevent pounding rain from splattering into an open flue. 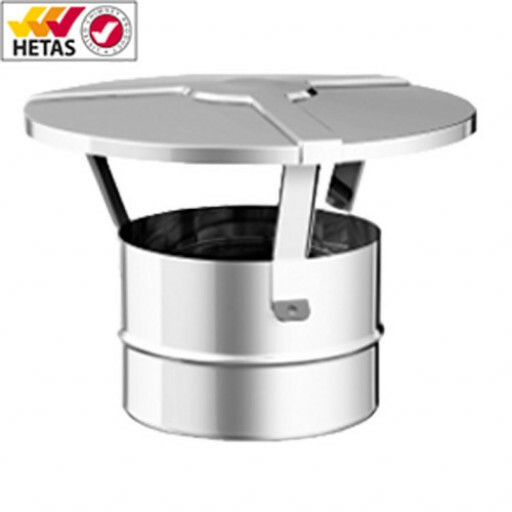 It carries a HETAS Certificate of Compliance for use in stove installations in England and Wales. The rain cap supplies a broad metal cap elevated by three metal arms. It furnishes an open area for the escape of heat, smoke, and fire fumes from the flue pipe. At The Fireplace Warehouse, we offer a wide array of stoves and fireplaces for the convenience of customers (including some beautiful electric and gas fire displays). We showcase a variety of useful accessories and spare components, too! This functional Solid Fuel Rain Cap helps enhance the enjoyment of customers by preventing heavy downpours from dampening the warmth of the hearth. Use it to increase the enjoyment provided by a warm stove during cold, damp winter weather conditions.